We don’t know what we don’t know. The best way is to learn something new is to explore the web (or world), and/or learn from experts. Sometimes we just don’t know, or even don’t expect what Excel could do for us. Then you should spend a few hours in the coming days to watch the three webinars (Yes, I recommend you to watch all three webinars) by Mynda. 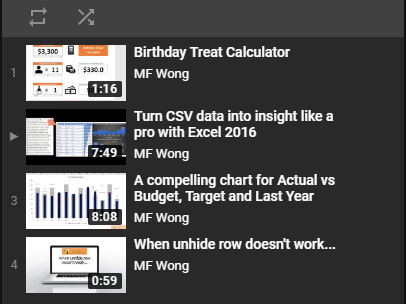 You will find the time worthy spent as you will learn many time-saver techniques in using Excel; and learn something about Power BI. Click here to register for webinar 1. Excel is evolving; in the last couple of years Microsoft have added new tools like Power Query and Power Pivot, to name a couple. Embracing these new tools will not only enable you to get your work done more quickly, but also since less than 1% of Excel users know these tools you’re going to have a huge competitive edge in the workplace. It’s easy to ignore these developments and continue doing things the way you always have, but that won’t get you ahead in your career, but you know that right? If you have Excel 2010, 2013, 2016, 2019 or Office 365* then this webinar will showcase how you can use Excel’s Power Query tool to get data from multiple sources, mash it up with Power Pivot, analyse it in PivotTables to create this interactive Excel Dashboard. *Power Query is available with all versions of Excel 2010, 2013, 2016, 2019 and Office 365. 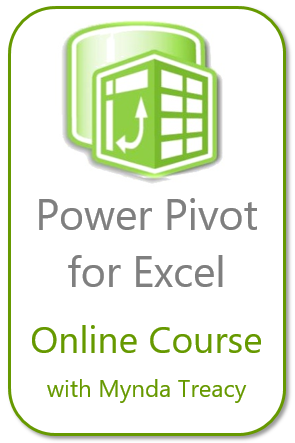 Power Pivot is available with the desktop version of Excel 2010 and Excel 2013/2016 Office Professional, Office 2019, Office 365, or in the standalone versions of Excel 2013/2016. Power Query and Power Pivot are not available for Mac. Click here to register for webinar 2. If you’ve seen Mynda’s free Dashboard Webinars and you’re ready to take your dashboard skills to the next level then check out Mynda’s Online Excel Dashboard course. The best part, aside from the praise from your boss and colleagues ;-), is you’ll also learn loads of tips you can use in your everyday Excel work to get things done more efficiently. Dashboards are an incredibly valuable tool in today’s market for consultants, analysts and managers. And when you know the tricks it can be straightforward to build highly professional and interactive Excel dashboards. That’s why this type of training is so worthwhile. I highly recommend the course, but don’t take my word for it. You can read further comments from past students and find out more here. I just wanted to remind you that the 20% early bird discount ends Thursday, Feb 7, at 8pm in Los Angeles to be exact. So, do yourself a favour and check out the course. The price is incredibly fair, the course is awesome and it’ll transform your Excel reports and possibly even your Excel career. Disclosure: I make a small commission for students who join Mynda’s course via my site (at no additional cost to you), but as you know I don’t just recommend anything and everything. It has to be of outstanding quality and value, and something I can genuinely recommend. After all, if doesn’t live up to what I’ve promised you’ll think poorly of me too and I don’t want that. Oh, and just watching the course videos won’t transform your career, as if you won’t become a Master Chef by just reading cookbooks. You have to actually put it into practice, but then you know that.